How criminal matatu crew are stealing from commuters on Thika Road. Gatundu South MP Moses Kuria drafts bill demanding county and national governments to pay suppliers within 90 days. Mysterious Objects Spotted in Thika's Sky. Home MTAANI NEWS Thika’s Journey towards city status begins with sh. 100m beautification, sewerage programme. 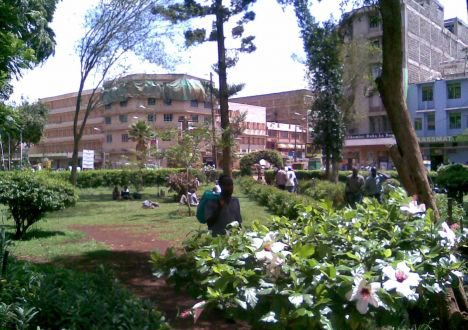 Thika’s Journey towards city status begins with sh. 100m beautification, sewerage programme. A File photo of Christina Wangari Gardens Thika. The journey towards having Thika elevated to a city has already began with Kiambu governor Ferdinand Waititu launching a sh. 100 million town beautification and sewerage expansion programme on Monday. This is the second time in a month that the governor is launching such a programme after launching a Ksh. 50 million storm water drainage system in Landless estate and the upgrading of 2.1 kilometre-long Mugo Kibiru Road in Section 9 to bitumen standards at a cost of Ksh. 79 million last month. In this second phase, Ksh. 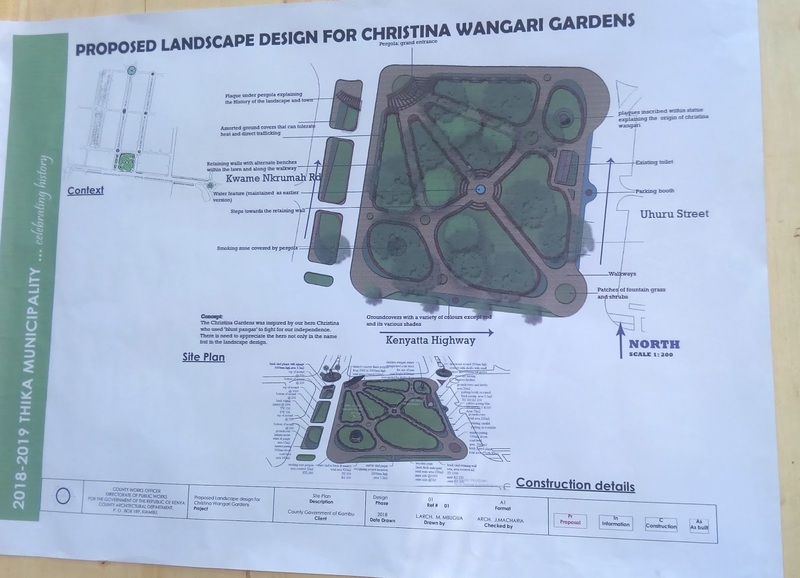 46 million has been set aside for the beautification of Christina Wangari Gardens and the 7 roundabouts within the Central Business District (CBD). The garden will be elevated into a modern recreation ground with a plaque under pergola explaining the landscape and history of Thika Town. There will be another plaque with inscriptions within the statue of Christina Wangari explaining the origin of this garden and the freedom fighter. The proposed landscape design for Christina Wangari Gardens. Christina Wangari is remembered for her bravery during the fight for Kenya’s independence from colonial rule where she used blunt pangas during the struggle. The fishpond at the centre of the garden will be revived and improved to operate just as in the heydays. They will also work on the assorted ground covers to ensure that it can tolerate the sun heat and direct human traffic unlike today where the grass succumbs to the two factors leaving the ground bare and dusty. The garden will also have security lights installed with also a security office to monitor the activities within the garden. There will be more seats designed in various forms to suit different tastes. Across the four corners, there will be some gates interconnected with concrete pavements to allow the members of public access the facility. While speaking during the launch, Waititu said that they would erect a perimeter wall around the facility and erect modern kiosks around it to avoid people littering the place with unplanned business structures. The two roundabouts at the entry of the CBD ie the one at Kenyatta highway near Bounjour Petrol Station and the KRA roundabout on Haile Selassie road will also be constructed having the town’s signature symbols of the pineapple and industries. The proposed landscape design for the 7 Thika town roundabouts. 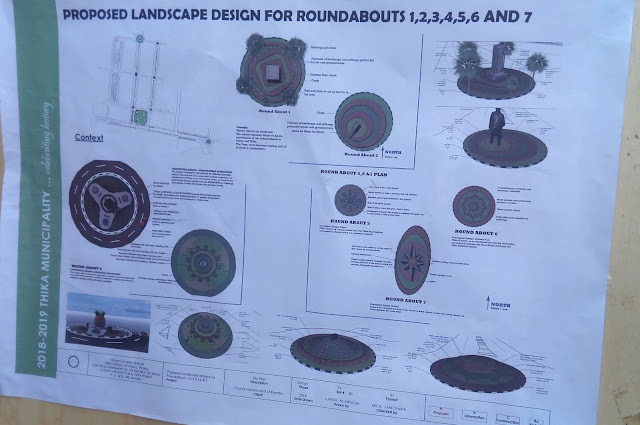 All the other five roundabouts will also be improved with green vegetation and other facelift features and later inter-connected with beautiful pavement structures between the streets. The governor also promised to seal all the potholes and open manholes within the town centre as from Monday next week. Within this programme, The World Bank and Kiambu government will spend about Ksh. 50 million for the expansion of the sewerage system in sprawling Kiganjo estate and Landless estate. 8,000 families to benefit from Del Monte land.